18 pp. Roman, 282 pp. The Manasir is an isolated region located at the great bend of the Nile in Northern Sudan. Its people, an amalgamation of tribal minorities, number approximately 30,445. The main economy in the area is a combination of subsistence and commercial farming, conducted with increasingly scarce land resources. In this study, the author focuses on the effects of land scarcity on the Manasir people. He considers the extent to which land scarcity has shaped the life of the people, what tools and mechanisms have been developed to reduce the impact of land scarcity and fragmentation, and the complex co-existence of Islamic inheritance law, customs and customary law, and government land legislation. 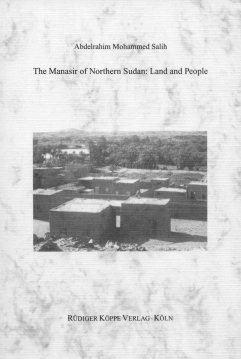 In order to ensure a full understanding of the relationship of the Manasir to their land, the author divides the book into two parts of equal length: part one provides a comprehensive ethnographic description and history of the Manasir, which is essential background information for part two, a sociological analysis of resource scarcity. He examines such coping strategies as the vertical expansion of production through intensification, diversification and a system of efficient irrigation. He describes the Manasirs’ system of dividing the produce rather than the land itself in order to cope with increasing land fragmentation, and the phenomenon of outmigration to urban centres, neighbouring areas, or oil-rich countries. The study goes beyond the boundaries of one single academic discipline, incorporating elements of economic anthropology, history, and political science, in order to arrive at a global picture of the Manasir. At all times, the author insists on the problematization of the concept of land, refusing to restrict himself to a narrow definition based only on geographic and economic terms. A German summary of the analysis appends the updated PhD thesis.